The result is obviously stunning. 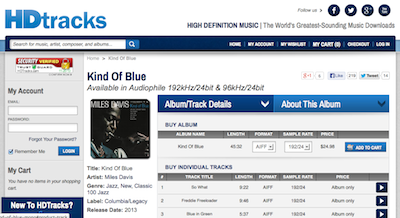 Kind Of Blue, now into the next level – it’s not just the hi-reso music but the new transfer from the original session reels. Simply spine-chilling. You may also watch the very interesting YouTube video explained by the superb engineer Mark Wilder, who previously appeared on my weblog, entitled “The Guy Who Saved Invaluable EmArcy Test Pressings”. and tagged 1959, Bill Evans, Cannonball Adderley, Columbia, Jazz, John Coltrane, Mark Wilder, Miles Davis.